The sporting world has so much to teach us. Inspiration literally walks, rolls, and crawls by us on a daily basis. I have always been a big believer in being present. To take a minute and reflect on where am I, where I have come from, and who has been a part of me getting there. As a senior member of teams, I always encourage the debutants to put their phones away and keep their eyes up. To experience this moment now whether it be incredible or forgettable. Be present. I am grateful for many things I have experienced and achieved and one of those includes crossing paths with many training colleagues from the para world. These legends have such a wonderful outlook. Display uncanny professionalism and set examples by being exactly who they are. Here are 3 things that I have learned from my Para Buddies. Thank you for being a part of my sporting journey. For teaching me things just by being you. For some of these guys, they have been through extremely traumatic experiences. Not only have they survived it, but their experiences have made them the human beings that they are today. For those that have come from a host of different circumstances, have different classifications they approach their training with such joy to strive. When I was in high school, it was an interesting time as a teenager. A large majority of the teenage kids were immature. We were still working out who we were. Identity was a fluid concept and we were going through many changes that we didn’t really understand how to navigate. When I looked around I thought to myself, “we are all so different! Yet we play these mind games with ourselves and try to be like others” The real answers were there right in front of us. All we had to be was us. Throughout my career I have had the pleasure to meet, talk, discuss, live with, understand and befriend many of my Para Athlete buddies. Many of whom are my closest friends. Not a single one of this crew place their happiness in an event, in circumstance, or in the hands of others. They just are. They are not trying to be something else. They do not ask to be “compared” to able-bodied athletes. They are all so happy just being themselves. But make no mistake. These guys mean business. So don’t just remark in the amazement of their abilities. They are so professional in their approach to their craft. They are elite athletes and they are train to compete. They compete to win. The only difference with (the majority) of this crew is; a result is not going to make them any happier than they already are. They sorted that out long ago! Most people have already worked this out, but for those who haven’t I will let you in on a secret. The key to success is in enjoyment. Now I am not here to tell you what “success” is, that is something that we determine for ourselves. I am here to tell you that for the most part, the sporting world is a helluva good time. I have had so much fun during my career and most of it had a lot to do with others with sharing the same philosophy. After completing the entire season of 2012 with a horrible knee injury, I relocated to Canberra, had surgery and underwent 4 months of intensive rehabilitation. During this time I lived together with 3 para guys, and 2 able bods. Rehabbing injuries is a timely process. It can be boring and it may also have setbacks. Our little crew, however, (predominantly para-athletes) were so key in getting me through these battles. We discussed their disabilities and how they deal with it in their daily life, their mental state and mental approach, and how they tackled challenges. It was fantastic to speak openly and sometimes recklessly about all topics. Nothing was off limits. I am so grateful for the privilege to be a sportsperson and I am even more thankful for these guys and their humble support. We just have SO MUCH FUN TOGETHER! Before heading to Rio for the Olympics our Aussie team had a precamp in Bradenton, Florida. I am usually based in Europe as I work full time and compete in the European Circuit. When coach (Dad) and I arrived in Florida, I was elated to see that “The Boys” Scotty Reardon, Chad Perris, Evan O’Hanlon were also training there! Being an Australian Team member is an incredible experience. When we come together, we really do have a good time. (Well I do anyway, and that is what is most important to me) My road to Rio was very bumpy with injury and it would be fair of me to say that I had a few mental battles in the lead-up. But meeting the little crew was an unexpected pleasure. Every afternoon we would sit around, brew a coffee, yarn and have a good old laugh. I was able to gain some perspective and just enjoy not so much the result but the journey. “I thought Albinos literally had to avoid the sun?” Were the words that left my clumsy mouth and perhaps came across a little ignorant. I don’t think I need to unpack this point any more than that. If you are around a sporting arena and you cross paths with an athlete with a disability don’t just marvel in their ability to participate, sometimes with limbs missing, no vision, cerebral palsy or from a wheelchair. Marvel at how able they are to be themselves. See them as an elite athlete who trains and dedicates their life to be the best that they can be. Go and have a yarn with them. Who knows? Maybe you might learn something. 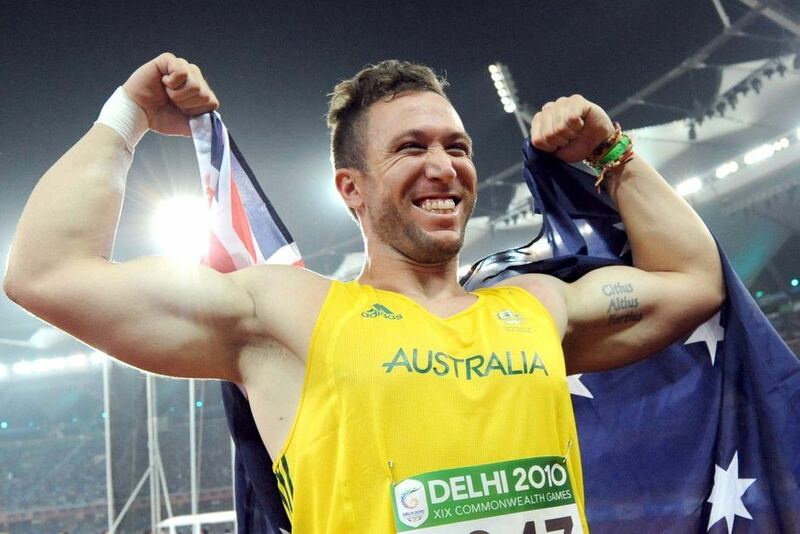 Benn Harradine is an Australian discus throw athlete competing at this year’s Gold Coast Commonwealth Games. Benn has also competed at the 2008 Summer Olympics in Beijing and the 2012 Summer Olympics in London. Benn made the final of the discus at the 2006 Commonwealth Games in Melbourne where he finished eighth. He went on to win the 2010 Commonwealth title. His 5th place finish at the 2011 World Championships is the best ever finish by an Australian man in the event. Benn has broken the Australian record three times, his current personal best being 68.20 metres thrown in Townsville in May 2013. Benn is a proud indigenous athlete from the Wotjobaluk tribe in the Wimmera district of Victoria. He cites land rights activist Vincent Lingiari as one of the people he admires. He is recognized in the Australian Olympic Committee list of Australian Indigenous Olympians.